Natural marble with immense beauty has enormous workability due to its ageless characteristic. 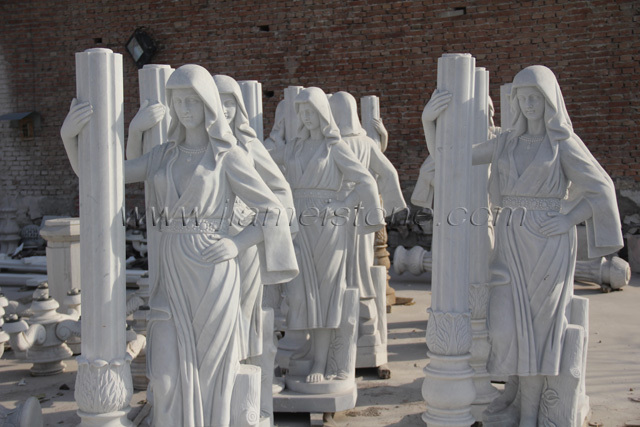 Jiamei Stone hand carve a large selection of attractive elegant marble statues, sculptures, marble figure and busts. Our statues range from indoor small statues to large life size outdoor lawn and garden sculptures, from modern contemporary art carving to replicas of the classic ancient world's famous statues and sculptures including Italian Roman marble statues such as King David sculpture by Michelangelo and Venus de Milo sculpture; Greek marble statues such as Aphrodite sculpture; and religious statues such as sculptures depicting stories of Virgin Mary and Cherubs. Jiamei Stone specialise in making the finest exact copies of marble sculpture originals and have the largest selection of marble sculpture for sale in the world. Our sculptures are for people who understand the joy of bringing a piece of quality art into the home. We have a huge range of statues, busts, fireplace, vases, fountains, columns and much more available for viewing and purchase in our collection. XIAMEN JIAMEI STONE CO., LIMITED.